Clayton Edward Kershaw (born March 19, 1988) is an American professional baseball pitcher for the Los Angeles Dodgers of Major League Baseball (MLB). A left-handed starting pitcher, Kershaw has played in the major leagues since 2008, and his career earned run average (ERA) and walks and hits per innings pitched average (WHIP) are the lowest among starters in the live-ball era with a minimum of 1,000 innings pitched. Kershaw has a career hits allowed per nine innings pitched average of 6.64—the second-lowest in MLB history—along with three Cy Young Awards and the 2014 National League Most Valuable Player Award. Kershaw was drafted seventh overall in the 2006 MLB draft. He worked his way through the Dodgers' farm system in just one full season, and reached the majors at 20 years old. When he debuted in 2008, he was the youngest player in MLB, a title he held for one full year. In 2011, he won the pitching Triple Crown and the National League Cy Young Award, becoming the youngest pitcher to accomplish either of these feats since Dwight Gooden in 1985. Kershaw pitched a no-hitter on June 18, 2014, becoming the 22nd Dodger to do so. Being a left-handed strikeout pitcher and playing for the Los Angeles Dodgers, Kershaw has often been compared to Hall of Fame pitcher Sandy Koufax. He became the first pitcher in history to lead MLB in ERA for four consecutive years when he did so in the 2011 through 2014 seasons. Off the field, Kershaw is an active participant in volunteer work. He and his wife, Ellen, launched "Kershaw's Challenge" and wrote the book Arise to raise money to build an orphanage in Zambia. He has been honored with the Roberto Clemente Award and the Branch Rickey Award for his humanitarian work. Kershaw was born in Dallas, Texas on March 19, 1988. His parents divorced when he was 10, and he was raised by his mother. He played in youth sports leagues as a child, including Little League Baseball. Kershaw attended nearby Highland Park High School, where he played baseball and was also the center for quarterback Matthew Stafford on the football varsity. After a growth spurt and further development of his pitches, he established himself as an elite high school prospect in 2006 when he posted a 13–0 record with an earned run average (ERA) of 0.77, and recorded 139 strikeouts in 64 innings pitched. In a playoff game against Northwest High School of Justin, Texas, Kershaw pitched an all-strikeout perfect game. He struck out all 15 batters he faced in the game, which was shortened because of the mercy rule. He also pitched for USA Baseball's Junior National Team in the Pan Am Championship. Kershaw was selected by USA Today as "High School Baseball Player of the Year", and was also the Gatorade National Player of the Year for baseball. Entering the 2006 Major League Baseball (MLB) draft, Kershaw was considered the top high-school pitcher available. The Los Angeles Dodgers selected Kershaw with the seventh overall pick in the draft. He had committed to Texas A&M University, but turned down the scholarship offer to sign with the Dodgers, with a bonus estimated at $2.3 million. The bonus was the largest to any Dodgers draft pick at the time, and was eventually topped by Zach Lee in the 2010 draft. 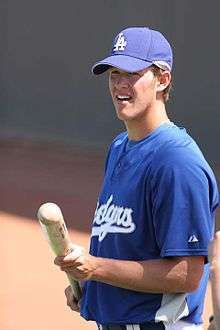 Kershaw began his career with the Gulf Coast League (GCL) Dodgers. He pitched in 37 innings in which he struck out 54 batters (walking only 5), while compiling a record of 2–0 with a 1.95 ERA. He featured a fastball that topped out at 96 miles per hour (154 km/h) and he was rated as the top prospect in the GCL, and the Dodgers' second best prospect by Baseball America behind third baseman Andy LaRoche. Kershaw was promoted to the Great Lakes Loons in 2007, where he recorded a record of 7–5 with a 2.77 ERA. He was selected to play on the East Team in the Midwest League All-Star Game and on the USA team in the All-Star Futures Game. On August 6, he was promoted to the Double-A Jacksonville Suns in the Southern League, where he produced a 1–2 record and 3.65 ERA in five starts and was selected as the top prospect in the Dodgers organization heading into the 2008 season. During spring training in a game against the Boston Red Sox, Kershaw gained much attention for throwing a curveball to Sean Casey that started behind Casey but at the end looped into the strike zone and struck him out looking. Kershaw was 0–3 and had a 2.28 ERA with 47 strikeouts through 43 1⁄3 innings pitched in his first stint of the year with the Suns. He was then called up to the majors on May 28, 2008, but optioned back to Jacksonville on July 2. Kershaw pitched 18 innings during his second trip to Jacksonville (two starts and one seven inning relief appearance), winning two games. During this stretch, he allowed only two runs earned runs, lowering his ERA to 1.91. He was recalled on July 22. On May 24, 2008, the Dodgers bought Kershaw's minor-league contract, and he was added to the active roster. Sportswriter Tony Jackson called Kershaw's debut the most anticipated start by a Dodgers pitcher since Hideo Nomo's major league debut during the 1995 season. He made his debut on May 25, starting against the St. Louis Cardinals. He struck out the first batter he faced, Skip Schumaker, the first of seven strikeouts in the game, in which he pitched six innings and allowed two runs. When he debuted, Kershaw was the youngest player in MLB, a title he held for one full year. Kershaw won his first major league game against the Washington Nationals on July 27, 2008. He pitched six-plus shutout innings, allowing four hits, a walk, and he struck out five. Kershaw finished his rookie season 5–5, with a 4.26 ERA in 22 games (21 starts). He also pitched two innings out of the bullpen for the Dodgers in the 2008 National League Championship Series (NLCS) against the Philadelphia Phillies. On April 15, 2009, Kershaw pitched seven innings, striking out 13 batters while allowing only one hit (a solo home run) against the rival San Francisco Giants. He was the youngest Dodger to ever strikeout 13 or more batters in a game since Sandy Koufax did it in the 1955 season. On May 17, 2009, Kershaw did not allow a hit against the Florida Marlins through 7 innings, then gave up a lead-off double to Florida's Cody Ross. In 2009, despite an 8–8 record, he led the major leagues in opposing batting average (.200), opposing slugging percentage (.282), and hits per nine innings (6.26). He also posted an ERA of 2.79 and 185 strikeouts. Kershaw also walked 91 batters, which was second most in the National League (NL). Kershaw made his playoff starting debut against the St. Louis Cardinals in the 2009 National League Division Series (NLDS). He went 6 2⁄3 innings, striking out 4, walking 1, and ended up getting a no-decision (the Dodgers went on to win the game in the 9th inning). At 21 years old, he started the opener of the 2009 NLCS against the Philadelphia Phillies and was the third youngest pitcher to ever start a playoff series opener, behind only Fernando Valenzuela in the 1981 NLDS and Rick Ankiel in the 2000 NLDS. Kershaw started the 2010 season by posting a 3.07 ERA in April, but did so by walking 22 batters in 29 innings. On May 4, he had his worst start of his career against the Milwaukee Brewers at Dodger Stadium, throwing just 57 pitches in 1 1⁄3 innings, while retiring only four of the 13 batters he faced—including the pitcher. He was booed loudly upon being pulled from the game. Kershaw said after the game, "I didn't give our team any kind of chance. It's just not a good feeling to let your teammates down, let everybody down. It stings, it hurts. I've got to figure things out." Kershaw rebounded his next start by pitching an 8 inning two-hitter and out-dueling the then undefeated Ubaldo Jiménez. He credited his control of the slider being the major turning point for him. Later in the season, he was suspended for five games after hitting Aaron Rowand of the Giants with a pitch in a game on July 20. The incident occurred after both teams were given a warning following Giants ace Tim Lincecum hitting Matt Kemp earlier in the game. He threw his first career complete game shutout on September 14, 2010 also against San Francisco and finished the season with a record of 13–10 and a 2.91 ERA in 32 starts, pitching 204 1⁄3 innings and recording 212 strikeouts. After finishing the 2010 season strong, the Dodgers named Kershaw as the Opening Day Starter for the 2011 season. On May 29, he pitched the second complete-game shutout of his career, striking out 10 while winning a two-hitter against the Florida Marlins, 8–0; he also had two singles and an RBI, scoring twice in the game. He produced his third career shutout on June 20, a two-hit, 11-strikeout effort against the Detroit Tigers. Kershaw became the first Dodgers starter to strike out the side in the 9th inning since Sandy Koufax's perfect game. In his next start, on June 26, Kershaw pitched another complete game (against the Los Angeles Angels of Anaheim). He became the first Dodger starter to have back-to-back complete game victories since Jeff Weaver in the 2005 season and the first Dodger to have double-digit strikeouts in consecutive starts since Chan-Ho Park in the 2000 season. He was awarded the National League Player of the Week award for the week of June 20–26 as a result of those two starts. Midway through June, Kershaw had amassed 32 career victories, a 3.15 ERA and 593 career strikeouts in 568.2 innings. According to the Elias Sports Bureau, Kershaw was the first 23-year-old pitcher to have that many victories, an ERA that low and an average of more than one strikeout per inning since ERA became an official statistic in 1910. Kershaw was selected to the National League team for the 2011 Major League Baseball All-Star Game, his first All-Star selection. In the month of July, Kershaw was 4–1 with a 2.02 ERA and NL-leading 45 strikeouts, earning him the National League Pitcher of the Month Award. On August 23, he struck out Matt Holliday of the St. Louis Cardinals for his 200th strikeout of the season and became the 10th Dodger pitcher to record back-to-back 200 strikeout seasons and the first since Chan-Ho Park did it in the 2001 season. Kershaw finished the 2011 season by leading the NL with 21 wins, 248 strikeouts and a 2.28 ERA, winning the NL pitching Triple Crown, the first Triple Crown winner since Jake Peavy of the 2007 San Diego Padres and the first Dodger since Sandy Koufax won it in the 1966 season. Justin Verlander of the Detroit Tigers won the American League Triple Crown the same season, marking the first major-league season since 1924 to feature Triple Crown-winning pitchers in both leagues. Kershaw's 21 wins were the most by a Dodger pitcher since Orel Hershiser won 23 during the 1988 season. His ERA was the lowest by a Dodger since Hershiser's 2.03 in the 1985 season, his strikeouts were the most by a Dodger since Koufax's 317 in 1966 and his 233 1⁄3 innings pitched were the most since Chan Ho Park pitched 234 in 2001. Since 1965 when Koufax did it, Peavy and Kershaw are only two pitchers in the National League have led the league in wins, strikeouts, ERA, and WHIP (walks plus hits per inning pitched). Kershaw also became just the second lefthander to have a 240-plus strikeouts in a season before the age of 24, joining Vida Blue. After the season, Kershaw was awarded the Warren Spahn Award as the best left-handed pitcher in 2011, the Players Choice Award for Most Outstanding National League pitcher, the Gold Glove Award as the top fielding pitcher in the NL  and the Sporting News (TSN) National League Pitcher of the Year. He was additionally selected as the starting pitcher for the TSN NL All-Star Team. On November 17, he was honored with the National League Cy Young Award, making him the youngest Cy Young winner since Dwight Gooden of the 1985 New York Mets. He was the 8th Dodger pitcher to win the award, the first since Éric Gagné in the 2003 season. On February 7, 2012, Kershaw and the Dodgers agreed on a two-year, $19 million contract. The contract was the second highest for a player in his first year of arbitration (after Tim Lincecum's $23 million 2-year contract in 2010). Kershaw was the Dodgers' Opening Day starter for the second year in a row, where he pitched three innings of shutout ball against the San Diego Padres at Petco Park before being removed from the game due to flu-like symptoms. On April 27, he was able to last through eight innings for his second win of the season against the Washington Nationals. The win was also his 12th straight home win, tying him with Ed Roebuck (June 1960 – August 1962) and Orel Hershiser (September 1984 – October 1985) for the longest home winning streak since the Dodgers moved to Los Angeles. Kershaw won the National League's Player of the Week Award for the week of May 14–20 after he made two starts during that week and pitched 16 scoreless innings, including his fourth career shutout. Kershaw was selected to appear in the 2012 Major League Baseball All-Star Game, the second straight year he made the team. On August 11, he went over 200 innings on the season, becoming the 12th Los Angeles Dodger pitcher with three or more seasons of 200 or more innings, and the first since Hershiser did it five times from 1985 to 1989. Kershaw also became just the fifth Dodger pitcher with three straight 200 strikeout seasons. Kershaw finished 2012 with a 14–9 record, a 2.53 ERA (leading the league), 229 strikeouts, and 227 2⁄3 innings pitched, coming second in both categories. He became the first pitcher to lead the league in ERA in consecutive seasons since Arizona's Randy Johnson in 2001–02. This was also marked his fourth year in a row with a sub-3.00 ERA, making him the first to do this since Randy Johnson from 1999–2002. He finished second for the NL Cy Young behind R. A. Dickey, receiving two first place votes. Kershaw made his third straight opening day start for the Dodgers in the 2013 season, the first Dodger starter to do so since Derek Lowe (2005–2007). In that opening day start he pitched a complete game, four hit, shutout over the Giants and also hit his first career home run. He was the first pitcher to throw a shutout and hit a home run on opening day since Bob Lemon of the Cleveland Indians did so against the Chicago White Sox on April 14, 1953. Kershaw picked up his 1,000th career strikeout on April 17, 2013, when he struck out Yonder Alonso of the Padres. He was the second youngest Dodger to reach that mark, behind only Fernando Valenzuela. On May 14, Kershaw passed the 1,000 inning mark for his career. His ERA of 2.70 at the time was the fifth best of the live-ball era at the 1,000 inning mark and the best career mark. He also threw 130 pitches that day, the most of his career and the most by a Dodger pitcher since Odalis Pérez in the 2003 season. Kershaw was selected to the 2013 Major League Baseball All-Star Game, his third straight selection. In July, he compiled a 4–1 record and 1.34 ERA in six starts and was awarded his second National League Pitcher of the Month Award. On September 2, Kershaw picked up his 200th strikeout of 2013, joining Hall of Famers Sandy Koufax and Don Drysdale as the only starters in Dodgers history with at least 4 consecutive seasons of more than 200 strikeouts. Kershaw finished the season with a 16-9 record, 236 innings pitched (a career high), and a Major League best 1.83 ERA and 0.92 WHIP. He was the third player in history to lead the Majors in ERA three years in a row, joining Greg Maddux (1993–95) and Lefty Grove (1929–31). His ERA was the first sub-2.00 ERA since Roger Clemens did it in the 2005 season and the lowest overall since Pedro Martínez in the 2000 season. He was only the third Dodger pitcher to have an ERA under 3.00 in five consecutive seasons (Koufax and Nap Rucker). Kershaw struck out 12 batters in seven innings in the first game of the 2013 National League Division Series. That was the third most strikeouts by a Dodger pitcher in the playoffs, behind only Koufax (15 in the 1963 World Series) and Carl Erskine (14 in the 1953 World Series). His six straight strikeouts in the game tied a MLB postseason record set by Tim Belcher in the second game of the 1988 World Series. He picked up his first career postseason victory in that game. Kershaw won the Warren Spahn Award for 2013, the second time he had won the award, which honors the best left-handed pitcher in the Major Leagues. He was also selected to the Sporting News NL All-Star team, the fourth Dodger pitcher to be named to the team twice (after Koufax, Valenzuela and Don Newcombe). On November 13, he won the NL Cy Young Award for the second time in three seasons. He became just the sixth pitcher in history to finish in the top two in voting three seasons in a row. After the season, Kershaw and the Dodgers agreed on a seven-year, $215 million, contract extension. The deal was the richest in MLB history for a pitcher, eclipsing the seven-year, $180 million, contract signed by Justin Verlander the previous year. The average annual value of $30.7 million was also the largest ever for a baseball player, beating the $28 million Roger Clemens received in 2007 and the 10-year, $275 million contract that Alex Rodriguez signed that same year. Kershaw made his fourth straight opening day start for the Dodgers in 2014, only the fourth Dodger ever to do so. This season the game was played at the Sydney Cricket Ground in Australia. Before his second start, Kershaw felt some pain in his back and was placed on the disabled list for the first time in his career. He did not rejoin the Dodgers until early May. On June 18, he pitched a complete game no-hitter against the Colorado Rockies and struck out a career-high 15 batters. The only batter to reach base was due to an error in the top of the seventh inning, costing Kershaw a perfect game. He is the only pitcher in MLB history with 15 strikeouts in a game while allowing no hits and no walks. Kershaw was 6-0 with an 0.82 ERA in June and was awarded with his third career Pitcher of the Month award. He was selected to the National League squad at the 2014 Major League Baseball All-Star Game, his fourth straight selection. He was the sixth Dodger pitcher, and the first since Fernando Valenzuela to make the All-Star team four years in a row. Kershaw had a 41 inning scoreless inning streak that ended in the top of the sixth inning on July 10 when, with two outs, Chase Headley homered to left field at Dodger Stadium. Kershaw's streak was, at the time, tied for the fifteenth longest scoreless inning streak in MLB history. He won the pitcher of the month award again in July, the third Dodger (along with Don Sutton and Burt Hooton) to win it two months in a row. He was 4–0 with a 1.10 ERA in the month with 48 strikeouts and only 10 walks. He picked up his 200th strikeout of the season on September 2, the fifth year in a row he had reached that number, trailing only the six seasons in a row for Sandy Koufax among Dodger starters. He also became just the fourth pitcher since 1893 to have at least five 200-strikeout seasons through an age-26 season (Bert Blyleven, Walter Johnson and Sam McDowell are the others). Kershaw finished the season 21–3 with a 1.77 ERA in 27 starts. He led the National League in numerous categories once again, such as ERA, ERA+, Wins, Win %, WHIP, IP/GS, SO/9, Strikeout-to-walk ratio, complete games, FIP, and Wins Above Replacement for both pitchers and all NL players. He also finished third in strikeouts despite missing most of the first month of the season. He was the first pitcher in history to win four consecutive ERA titles. Many experts called his 2014 season one of the best pitching seasons in recent memory. However, in his first start of the playoffs, in Game 1 of the Division Series against the Cardinals, Kershaw became the first pitcher in history to strike out 10 while allowing eight runs. He had cruised through the first six innings while allowing only two hits (both solo homers) and surrendered six runs in the seventh. He did tie Koufax for the only Dodgers pitchers with multiple double digit strikeout games in the playoffs. He was also the first pitcher in history to give up at least seven runs in back-to-back postseason starts (his previous one was Game 6 of the 2013 National League Championship Series). Pitching on short rest in Game 4, he would again be dominant, but again would take the loss after giving up a 3-run home run to Matt Adams in the 7th inning. It was the first home run Kershaw had allowed in his career to a left-handed batter off his curveball. Kershaw was honored after the season with player of the year awards from both The Sporting News and Baseball America. He won three awards at the Players Choice Awards including Outstanding NL Pitcher, Player of the Year and the Marvin Miller Man of the Year Award. He also won his third (and second straight) Warren Spahn Award. On November 12, he was awarded his third Cy Young Award in four seasons (a unanimous vote). The following day, he was elected as the NL MVP, the first National League pitcher to win the award since Bob Gibson in 1968 and the first Dodgers player to win the award since Kirk Gibson in 1988. Kershaw made his fifth straight opening day start in 2015, the first Dodgers pitcher to do so since Hall of Famer Don Sutton started seven in a row from 1972 through 1978. He recorded his 1,500th career strikeout on May 10 when he fanned Drew Stubbs of the Colorado Rockies. Kershaw picked up his 100th career win on May 15 against the Rockies. He became the 22nd pitcher in franchise history and the second youngest active pitcher to reach that mark. Kershaw won his sixth career NL player of the week award for the week of June 1–7, 2015, when he allowed only two runs on 10 baserunners in 15 innings while striking out 18 in two starts that week. Kershaw did not make the initial NL roster for the 2015 All-Star Game, though he was included on the Final Vote ballot, which he lost to Cardinals pitcher Carlos Martinez. However, he was added to the roster to replace Nationals pitcher Max Scherzer, who was unavailable due to pitching the Sunday before the game. It became his fifth straight all-star selection, joining Sandy Koufax and Fernando Valenzuela as the only Dodgers pitchers to accomplish that feat. Kershaw struck out a season high 14 batters in eight shutout innings on July 18 against the Washington Nationals. He became the first Dodgers starter with back-to-back games of at least 13 strikeouts since Chan Ho Park in 2000 and the first Dodgers pitcher with back-to-back games of double-digit strikeouts and no walks since Dazzy Vance in 1930. He shared the NL player of the week honors with his teammate Zack Greinke for the week of July 13–19 and won NL pitcher of the month for July. Kershaw picked up his 200th strikeout of the season on August 12, tying Hideo Nomo's 1995 season for the fastest to that mark in Dodgers history at 156 innings. This was the sixth straight 200 strikeout season for Kershaw, tying Sandy Koufax for the most in Dodgers franchise history. On October 4, Kershaw became the 11th player in Major League history to strike out 300 batters in a season, the first player since Randy Johnson did it in 2002. He finished the season with a 16–7 record, a 2.13 ERA, and 301 strikeouts in 232 2⁄3 innings. In Game One of the 2015 National League Division Series, Kershaw struck out 11 in 6 2⁄3 innings but allowed three runs for his fifth straight postseason loss. He and New York Mets starter Jacob deGrom were the first pair of starters to each throw at least 11 strikeouts in the same postseason game in MLB history. He rebounded in game four, earning the win on three days' rest by allowing one run and three hits against eight strikeouts in seven innings on October 13. Kershaw finished third in the National League Cy Young Award voting, behind Jake Arrieta and teammate Zack Greinke. In mid-December 2015, Kershaw participated in an expedition to Cuba composed of MLB officials and players, including former Dodgers manager Joe Torre. It was the first visit by MLB since 1999, and one anticipated as an important step to help normalize relations with the United States that had begun to ease earlier in the year. Kershaw made his sixth straight opening day start in 2016 as the Dodgers won 15–0. It also marked the first time the Dodgers had won six straight opening day games, all of which he started. On May 12 against the New York Mets, he struck out 13 while pitching a three-hit complete game shutout. He set an MLB record with six consecutive starts with at least 10 strikeouts and no more than one walk and a club record with six consecutive starts with at least 10 strikeouts. He picked up his 100th strikeout on May 29, while only walking five batters within that period. That was the lowest walk total for a pitcher reaching 100 strikeouts in the modern era, beating Cliff Lee who had seven walks in the 2010 season. On June 30, 2016, Kershaw was placed on the 15-day disabled list due to back pain. He received an MRI, which revealed that there was a mild herniated disc in the back, and received an epidural injection to treat the pain. He was named to the 2016 All-Star team but was unable to pitch in the game due to his injury. On July 20, the Dodgers shut down Kershaw for an indefinite period of time. He continued to feel discomfort in his back after a simulated game. On August 3, Kershaw was transferred to the 60-day disabled list. He rejoined the Dodger rotation on September 9. He started 21 games in 2016, with a 12–4 record and 1.69 ERA. He also struck out 172 batters with only 11 walks. Kershaw started games one and four of the 2016 National League Division Series and picked up the save in the clinching game five. It was his first professional save since he was with the Gulf Coast Dodgers in his first minor league season in 2006. He next pitched seven shutout innings, allowing only two hits, in the second game of the 2016 National League Championship Series against the Chicago Cubs. He struggled in game six, allowing five runs in five innings to pick up the loss as the Dodgers were eliminated from post-season contention. Kershaw's pitching style relies on deception. He keeps the ball hidden so that it is hard for the batter to pick up the ball and has a consistent overhand delivery on all of his pitches. Out of the windup, Kershaw lowers his right foot vertically with a slight pause before moving it forward toward the plate. The motion was described during the 2015 National League Division Series as a "kickstand move" drawing comparison with one setting a kickstand on a bicycle. Out of the stretch, he uses a slide step as it makes it difficult for the base runner at first base to get a read on him. He has stated many times that he has modeled his pitching mechanics after his favorite pitcher growing up, Roger Clemens. Kershaw's repertoire includes a four-seam fastball that sits anywhere from 92 miles per hour (148 km/h) to 95 miles per hour (153 km/h) and tops out at 98 miles per hour (158 km/h) with late movement, a slider at 84 miles per hour (135 km/h)–87 miles per hour (140 km/h), a 12–6 curveball between 72 miles per hour (116 km/h)–76 miles per hour (122 km/h), and a seldom thrown changeup (under 3%). As of late in the 2015 season, he is believed to be experimenting with the use of a cutter. He is also known for having one of the better pickoff moves to first base and is considered one of the better fielding pitchers in the game. Three fastballs when I'm standing up. I sit, and three fastballs down the middle. Then three fastballs either side. Three changeups away. Fastball inside. Three curveballs to the middle. Fastball inside. Three sliders to the middle. Then he goes to the stretch position. Two fastballs inside, two fastballs away, two changeups, one fastball inside, two curveballs, one fastball inside, two sliders. Back to the windup, and one fastball inside, one fastball away. Thirty-four pitches in all. Notes: Through 2015 season. Per Baseball-Reference.com. Kershaw grew up in Dallas, Texas and attended school with quarterback Matthew Stafford  and fellow pitchers Jordan Walden  and Shawn Tolleson. One of his favorite players growing up was former Texas Rangers first baseman Will Clark, and the main reason he wears number 22 is to honor Clark. He is the great-nephew of astronomer Clyde Tombaugh, the discoverer of Pluto. Kershaw's mother, born Marianne Tombaugh, is the daughter of Clyde Tombaugh's younger brother. His father, Christopher George Kershaw, was a musician and won a Clio Award for his work. The elder Kershaw remarried after his divorce from Marianne and died in 2013. On December 4, 2010, Kershaw married his girlfriend of seven years, Ellen Melson. On January 23, 2015, Ellen gave birth to the couple's first child, daughter Cali Ann. He is a Methodist with strong religious faith. Kershaw made a cameo appearance in "Prince", a Season 3 episode of New Girl which originally aired following FOX's telecast of Super Bowl XLVIII. Prior to the 2011 season, Kershaw visited Zambia with his wife as part of a Christian mission organized by Dallas-based Arise Africa. After the trip, Kershaw announced his dream of building an orphanage in Lusaka, Zambia, which he called "Hope's Home" after 11-year-old Hope, an HIV-positive child Kershaw met while in Zambia. To accomplish his goal, Kershaw pledged a donation of $100 per strikeout recorded in 2011. With Kershaw's career high of 248 strikeouts thrown during the 2011 season, he donated $492,300 toward his $70,000 goal. When Kershaw won the 2011 Players Choice Award, he donated $260,000 to Hope's Home. He and his wife returned to Zambia in 2012. Kershaw donated $100 for every strikeout in the 2012 season to Kershaw's Challenge, calling that season's incarnation of the project "Strike Out To Serve." Seventy percent of the money raised in 2012 went to Arise Africa, with 10 percent each going to the Peacock Foundation in Los Angeles, Mercy Street in Dallas, and I Am Second. In 2014, Kershaw continued to support the children of Zambia, with partnership with CURE International, raising funds to pay for 170 children's surgeries and new medical equipment for CURE hospital in Lusaka. Kershaw has continued his partnership with CURE International in 2015, setting a goal of funding 100 surgeries for CURE's hospital in the Dominican Republic. In addition to Hope's Home and Kershaw's Challenge, he has also helped with other programs in Los Angeles, such as helping Habitat for Humanity demolish and rehabilitate a house in Lynwood, California. He is also a supporter of the Peacock Foundation, which provides animal-assisted interventions and activities for at risk youth by partnering with mental health practitioners, public service agencies and community organizations. Kershaw and his wife, Ellen, co-authored a book named Arise: Live Out Your Faith and Dreams on Whatever Field You Find Yourself about their Christian faith and their humanitarian efforts. The book was released on January 10, 2012 through Regal Press. Kershaw is a celebrity endorser for Wilson Sporting Goods (glove), Under Armour (shoes), Muscle Milk, and Subway. ↑ Mark Normandin (May 15, 2013). "Clayton Kershaw, historically relevant ace". SB Nation. Retrieved September 6, 2013. ↑ Ley, Tom. "Clayton Kershaw Is An Apex Predator". Deadspin. Retrieved June 12, 2016. ↑ Rubenstein. "Clayton Kershaw is the best pitcher ever". SB Nation. Retrieved June 12, 2016. ↑ Axisa, Mike. "Clayton Kershaw is still the best pitcher in the world, and he's still getting better". ↑ Dylan Hernandez (September 19, 2011). "Clayton Kershaw makes those Sandy Koufax comparisons plausible". Los Angeles Times. Retrieved September 28, 2011. ↑ Tony Jackson (August 4, 2011). "Clayton Kershaw: The stuff of legend?". ESPN. Retrieved September 28, 2011. ↑ Paul White (April 7, 2010). "Koufax-like Clayton Kershaw growing into ace Dodgers crave". USA Today. Retrieved September 28, 2011. 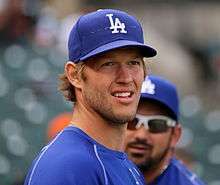 ↑ Ronald Blum, "Kershaw 1st to lead majors in ERA 4 straight years," Yahoo! Sports, September 28, 2014. ↑ Verducci, Tom (November 29, 2012). "My Sportsman: Clayton Kershaw". Sports Illustrated. Retrieved September 5, 2013. 1 2 "Childhood Friends: Clayton Kershaw & Matthew Stafford". Jr. Dodgers Blog. January 29, 2010. Retrieved September 5, 2013. ↑ "When Pro Athletes Were In Little League". Sports Illustrated. January 29, 2010. Archived from the original on April 8, 2013. Retrieved September 5, 2013. 1 2 3 4 Matthews, Alan (May 24, 2006). "Kershaw Could Cash In On Rapid Rise". Baseball America. Retrieved September 5, 2013. 1 2 PRNewswire (June 5, 2006). "(PRN) Clayton Kershaw Named Gatorade National Baseball Player of the Year". Houston Chronicle Online. Retrieved August 22, 2013. ↑ "Clayton Kershaw". Texas Monthly. February 2008. Retrieved August 22, 2013. ↑ Holmes, Tot (June 19, 2006). "First Round Pick Clayton Kershaw Signs". scout.com. Retrieved September 13, 2013. ↑ Remsberg, Matt (June 5, 2006). "Prep prospects prepare for draft while still in playoffs". SI.com. Retrieved September 13, 2013. ↑ "2006 First-Year Player Draft Tracker". mlb.com. Retrieved August 22, 2013. ↑ Heika, Mike (December 31, 2012). "A&M notes: Aggies' biggest concerns against Sooners; Clayton Kershaw sighting". Dallas Morning News. Retrieved August 22, 2013. ↑ Bolch, Ben and Kevin Baxter (August 16, 2010). "Dodgers, Angels sign their top draft picks". LA Times. Retrieved August 22, 2013. ↑ "2006 GCL Dodgers". Baseball Reference. Retrieved August 22, 2013. ↑ Eisenberg, Alex (May 13, 2008). "Is Clayton Kershaw worth the hype?". hardballtimes.com. Retrieved August 22, 2013. ↑ Matthews, Alan (September 20, 2006). "Gulf Coast League Top 20 Prospects List". Baseball America. Retrieved August 22, 2013. ↑ Matthews, Alan (February 20, 2007). "Top 10 Prospects: LA Dodgers". Baseball America. Retrieved August 22, 2013. ↑ "2007 Great Lakes Loons". Baseball Reference. Retrieved August 22, 2013. ↑ Bailey, Matt (June 20, 2007). "East Beats West In Midwest League ASG". scout.com. Retrieved August 22, 2013. ↑ Bernreuter, Hugh (June 21, 2007). "Kershaw to appear in Futures Game". mlive.com. Retrieved August 22, 2013. ↑ Shelley, Bill (August 7, 2007). "Kershaw Promoted to Jacksonville". scout.com. Retrieved August 26, 2013. ↑ "2007 Jacksonville Suns". Baseball Reference. Retrieved August 22, 2013. ↑ Matthews, Alan (December 3, 2007). "Top 10 Prospects: Los Angeles Dodgers". Baseball America. Retrieved August 22, 2013. ↑ Passan, Jeff (May 14, 2008). "Clayton Kershaw's great expectations". Yahoo! Sports. Retrieved November 25, 2008. ↑ Gurnick, Ken (May 25, 2008). "Dodgers call up Kershaw for Sunday". milb.com. Retrieved August 22, 2013. ↑ "Suns Split Doubleheader, Kershaw Optioned to Jacksonville". oursportscentral.com. July 2, 2008. Retrieved August 22, 2013. ↑ Hernandez, Dylan (July 22, 2008). "Kershaw will be recalled". LA Times. Retrieved August 22, 2013. ↑ Baxter, Kevin (May 24, 2008). "Kershaw likely to be called up". LA Times. Retrieved August 23, 2013. ↑ "Inside the Dodgers". Daily News. Los Angeles. May 24, 2008. Retrieved August 23, 2013. ↑ "May 25, 2008 St. Louis Cardinals at Los Angeles Dodgers Play by Play and Box Score". Baseball Reference.com. Retrieved August 23, 2013. ↑ "Yearly League Leaders & Records for Youngest". Baseball Reference.com. Retrieved August 23, 2013. 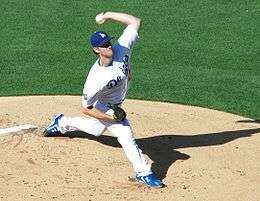 ↑ "HP's Kershaw gets first win with Dodgers". Dallas News. Associated Press. July 28, 2008. Retrieved August 23, 2013. ↑ "July 27, 2008 Washington Nationals at Los Angeles Dodgers Play by Play and Box Score". Baseball-Reference.com. Retrieved August 23, 2013. ↑ "2008 Los Angeles Dodgers Batting, Pitching, & Fielding Statistics". Baseball-Reference.com. Retrieved August 23, 2013. ↑ "2008 League Championship Series (4–1): Philadelphia Phillies (92–70) over Los Angeles Dodgers (84–78)". Baseball Reference.com. Retrieved August 23, 2013. ↑ "Dodgers rally in ninth to top Giants". espn.com. Associated Press. April 15, 2009. Retrieved August 23, 2013. ↑ "MLB: Kershaw takes no-hit bid into eighth, Dodgers beat Marlins". naplesnews.com. Associated Press. May 17, 2009. Retrieved August 23, 2013. 1 2 3 4 "Clayton Kershaw statistics and history". Baseball-Reference.com. Retrieved August 23, 2013. ↑ "2009 League Division Series (3–0): Los Angeles Dodgers (95–67) over St. Louis Cardinals (91–71)". Baseball-Reference.com. Retrieved August 23, 2013. ↑ Schlueter, Roger (October 1, 2011). "Fascinating facts from Friday's game". mlb.com. Retrieved August 23, 2013. ↑ Jackson, Tony (May 4, 2010). "Fielder, Zaun homers, Braun's double highlight Brewers' big inning". ESPN.com. Retrieved September 28, 2011. ↑ Livingstone, Seth (May 10, 2010). "NL Quick Pitch: Dodgers' Clayton Kershaw hands Ubaldo Jimenez first loss". USA Today. Retrieved August 23, 2013. ↑ Ramona Shelburne (September 25, 2011). "Clayton Kershaw has arrived". ESPNLosAngeles.com. Retrieved September 25, 2011. ↑ Ortiz, Jorge L. (July 21, 2010). "Clayton Kershaw and Joe Torre among suspended Dodgers". USA Today. Retrieved August 23, 2013. ↑ "2010 Los Angeles Dodgers Batting, Pitching, & Fielding Statistics". Baseball-Reference.com. Retrieved August 23, 2013. ↑ Tony Jackson (February 16, 2011). "Clayton Kershaw to start opener". espn.com. Retrieved August 23, 2013. ↑ Ben Bolch (May 29, 2011). "It's Clayton Kershaw and Dodgers' hitters who are smokin' this time". LA Times. Retrieved August 23, 2013. ↑ "Kershaw, Dodgers beat Tigers". ESPN. Associated Press. June 20, 2011. Retrieved September 28, 2011. 1 2 Spencer Fordin (June 27, 2011). "Huge week nets Kershaw NL honor". MLB.com. Retrieved September 28, 2011. ↑ Kurkjian, Tim (June 9, 2011). "Clayton Kershaw Built To Just Be Great". ESPN. Retrieved August 12, 2012. 1 2 Gurnick, Ken (July 3, 2011). "Kemp, Kershaw picked for first All-Star Game". mlb.com. Retrieved August 23, 2013. 1 2 Dilbeck, Steve (August 3, 2011). "Star bright: Clayton Kershaw named NL Pitcher of the Month". LA Times. Retrieved August 23, 2013. ↑ Stephen, Eric (August 23, 2011). "Clayton Kershaw: First Dodger With Back-To-Back 200-Strikeout Seasons Since 2001". Truebluela.com. Retrieved September 28, 2011. 1 2 3 4 5 Ken Gurnick (September 25, 2011). "Kershaw's 21 win of 2011 puts him in Triple Crown Position". MLB.com. Retrieved September 28, 2011. 1 2 Gurnick, Ken (October 21, 2011). "Kershaw recognized with Warren Spahn Award". mlb.com. Retrieved August 23, 2013. 1 2 Gurnick, Ken (November 3, 2011). "Kemp, Kershaw win Players Choice Awards". mlb.com. Retrieved August 23, 2013. 1 2 Dilbeck, Steve (November 1, 2011). "Dodgers' Matt Kemp, Andre Ethier and Clayton Kershaw all Golden". LA Times. Retrieved August 23, 2013. 1 2 Bahr, Chris (October 26, 2011). "Sporting News 2011 MLB awards: AL, NL All-Star teams". SI.com. Retrieved August 23, 2013. 1 2 Gurnick, Ken (September 26, 2011). "Kershaw is the winner of NL Cy Young Award". MLB.com. Retrieved November 11, 2011. ↑ Jackson, Tony (February 8, 2012). "Clayton Kershaw, Dodgers agree". ESPNLA.com. Retrieved August 23, 2013. ↑ Gurnick, Ken (April 5, 2012). "Flu knocks Kershaw out of Dodgers' opener". MLB.com. Retrieved August 23, 2013. ↑ Stephen, Eric (April 5, 2012). "Kershaw, Dodgers Win Nailbiter Over Nationals, 3–2". SBNation.com. Retrieved August 23, 2013. 1 2 Stephen, Eric (May 21, 2012). "Clayton Kershaw Wins National League Player Of The Week". truebluela.com. Retrieved August 23, 2013. 1 2 Bernreuter, Hugh (July 2, 2012). "Clayton Kershaw earns spot on National League All-Star team for Los Angeles Dodgers". mlive.com. Retrieved August 23, 2013. ↑ Stephen, Eric (September 11, 2012). "Clayton Kershaw Has Audacity To Allow One (Unearned) Run, Loses". truebluela.com. Retrieved August 23, 2013. ↑ Angert, Alex (September 5, 2012). "After Kershaw exits, Dodgers can't close Padres". mlb.com. Retrieved August 23, 2013. ↑ "Clayton Kershaw finishes with best ERA as Dodgers beat Giants". espn.com. Associated Press. October 3, 2012. Retrieved August 23, 2013. ↑ "R.A. Dickey Makes Knuckleball History". BBWAA.com. Retrieved August 23, 2013. ↑ Gurnick, Ken (April 1, 2013). "Kershaw dazzles with shutout, homer vs. Giants". mlb.com. Retrieved August 23, 2013. ↑ Stephen, Eric (April 17, 2013). "Clayton Kershaw 2nd fastest Dodger to 1,000 strikeouts". truebluela.com. Retrieved August 23, 2013. ↑ Stephen, Eric (May 15, 2013). "Clayton Kershaw in 100-inning chunks". truebluela.com. Retrieved August 23, 2013. 1 2 Gonzalez, Alden (July 17, 2013). "Kershaw turns in perfect All-Star third inning". mlb.com. Retrieved August 23, 2013. 1 2 Simon, Andrew (July 3, 2013). "Puig nabs NL Player, Rookie awards for June". mlb.com. Retrieved August 23, 2013. ↑ Stephen, Eric (September 2, 2013). "Clayton Kershaw first Dodgers pitcher since Sandy Koufax with 200 strikeouts in four straight years". truebluela.com. Retrieved September 2, 2013. ↑ "Clayton Kershaw Statistics". Baseball-Reference. Retrieved September 30, 2013. ↑ Stephen, Eric (September 27, 2013). "Dodgers 11, Rockies 0: Clayton Kershaw finishes in style". truebluela.com. Retrieved September 27, 2013. ↑ Gurnick, Ken (October 3, 2013). "Dodgers ace Game 1 behind Kershaw's 12 K's". latimes.com. Retrieved October 3, 2013. ↑ Stephen, Eric (October 11, 2013). "Clayton Kershaw wins 2013 Warren Spahn Award". truebluela.com. Retrieved October 11, 2013. ↑ Stephen, Eric (October 23, 2013). "Clayton Kershaw named to Sporting News NL All-Star team". truebluela.com. Retrieved October 23, 2013. ↑ Stephen, Eric (November 13, 2013). "Clayton Kershaw wins 2013 NL Cy Young Award". truebluela.com. Retrieved November 13, 2013. ↑ Shelburne, Ramona (January 15, 2014). "Dodgers, Clayton Kershaw have deal". ESPN.com. Retrieved January 15, 2014. ↑ Todd, Jeff (January 15, 2014). "Dodgers To Extend Clayton Kershaw". MLBTraderumors. Retrieved January 15, 2014. ↑ Stephen, Eric (March 21, 2014). "Clayton Kershaw puts Opening Day streak on the line". truebluela.com. Retrieved March 21, 2014. ↑ Townsend, Mark (March 29, 2014). "Dodgers place Clayton Kershaw on disabled list after back injury flares up". Yahoo! Sports. Retrieved June 7, 2014. ↑ "Clayton Kershaw throws seven shutout innings in return". Seattle Times. Associated Press. May 6, 2014. Retrieved June 7, 2014. 1 2 Gurnick, Ken (June 18, 2014). "Kershaw tosses first no-no as Dodgers rout Rockies". mlb.com. Retrieved June 18, 2014. ↑ "Top Ten Facts on Kershaw's no-hitter". ESPN. June 19, 2014. Retrieved June 19, 2014. 1 2 Stephen, Eric (July 2, 2014). "Clayton Kershaw named NL Pitcher of the Month for June". truebluela.com. Retrieved July 2, 2014. 1 2 Stephen, Eric (July 6, 2014). "Clayton Kershaw, Yasiel Puig lead 4 Dodgers named to All-Star team". truebluela.com. Retrieved July 6, 2014. ↑ "Innings Pitched Records & Scoreless Innings Pitched Records". Baseball Almanac. Retrieved July 11, 2014. 1 2 Stephen, Eric (August 4, 2014). "Clayton Kershaw wins NL Pitcher of the Month for July". truebluela.com. Retrieved August 4, 2014. ↑ Stephen, Eric (September 2, 2014). "Clayton Kershaw reaches 200 strikeouts for 5th straight year". truebluela.com. Retrieved September 2, 2014. 1 2 Schlueter, Roger (September 3, 2014). "MLB Notebook: Kershaw king of the hill". mlb.com. Retrieved September 3, 2014. ↑ Gurnick, Ken and Michael Lannana (September 28, 2014). "After sim game, Kershaw on pace for NLDS opener". mlb.com. Retrieved September 29, 2014. ↑ Kepner, Tyler (September 27, 2014). "In M.V.P. Race, as on Mound, Kershaw Is Hard to Beat". NYtimes.com. Retrieved September 27, 2014. ↑ Svrluga, Barry (September 16, 2014). "Clayton Kershaw makes NL Cy Young race non-existent". mlb.com. Retrieved September 16, 2014. ↑ "Cardinals stretch Clayton Kershaw past his limit to take Game 1". truebluela.com. October 4, 2014. Retrieved October 5, 2014. ↑ Schoenfield, David. "How long should a starter stay in?". SweetSpot Blog -ESPN. Retrieved October 9, 2014. 1 2 Spector, Jesse (October 23, 2014). "Clayton Kershaw edges Mike Trout for Sporting News Player of the Year". Sporting News. Retrieved October 23, 2014. 1 2 Shaikin, Bill (October 21, 2014). "Major League Player of the Year: Baseball's Best Pitcher Keeps Looking Ahead". baseballamerica.com. Retrieved October 21, 2014. 1 2 3 4 Stephen, Eric (November 3, 2014). "Clayton Kershaw 3 Players Choice Awards, including MLB Player of the Year". truebluela.com. Retrieved November 3, 2014. 1 2 Stephen, Eric (November 6, 2014). "Clayton Kershaw wins 2014 Warren Spahn Award". Truebluela.com. Retrieved November 6, 2014. ↑ Stephen, Eric (November 12, 2014). "Clayton Kershaw wins 3rd NL Cy Young Award". truebluela.com. Retrieved November 12, 2014. 1 2 Stephen, Eric (November 13, 2014). "Clayton Kershaw first pitcher in 46 years to win NL MVP". truebluela.com. Retrieved November 13, 2014. ↑ Gurnick, Ken (April 2, 2015). "Kershaw raises the bar, expectations for opener". mlb.com. Retrieved April 6, 2015. ↑ "Felix Hernandez, Clayton Kershaw pass strikeout milestones". Sports Illustrated. May 10, 2015. Retrieved May 10, 2015. ↑ Stephen, Eric (May 15, 2015). "Clayton Kershaw joins 100-win club". SB Nation. Retrieved May 16, 2015. 1 2 Weisman, Jon (June 8, 2015). "Clayton Kershaw named co-NL Player of the Week". Dodger Insider. Retrieved June 8, 2015. 1 2 Stephen, Eric (July 12, 2015). "Clayton Kershaw named to All-Star team as replacement for Max Scherzer". SB Nation. Retrieved July 12, 2015. ↑ Stephen, Eric (July 18, 2015). "Clayton Kershaw dominant in 14-strikeout win over Nationals". SB Nation. Retrieved July 18, 2015. 1 2 Stephen, Eric (July 20, 2015). "Clayton Kershaw, Zack Greinke share NL Player of the Week honors". SB Nation. Retrieved July 20, 2015. 1 2 Collier, Jamal (August 3, 2015). "Kershaw nets NL Pitcher of Month nod for masterful July". mlb.com. Retrieved August 3, 2015. ↑ Stephen, Eric (August 12, 2015). "Clayton Kershaw reaches 200 strikeouts for 6th straight season". SB Nation. Retrieved August 12, 2015. ↑ Saxon, Mark (October 4, 2015). "Clayton Kershaw finishes regular season with 301 strikeouts". ESPN. Retrieved October 5, 2015. ↑ DiComo, Anthony and Ken Gurnick (October 10, 2015). "Kershaw fans 11 but LA falls short in Game 1". mlb.com. Retrieved October 10, 2015. ↑ "Clayton Kershaw tosses 7 innings on short rest as Dodgers force Game 5". ESPN. Associated Press. October 13, 2015. Retrieved October 14, 2015. ↑ "Baseball Awards Voting for 2015". Baseball Reference. Retrieved 7 December 2015. ↑ Quiñones, Ronal (December 18, 2015). "Joe Torre: Baseball can unite Cuba and the USA". Havana Times. Retrieved December 19, 2015. ↑ Goold, Derrick (December 18, 2015). "Torre exhilarated by reception in Cuba". St. Louis Post-Dispatch. Retrieved December 19, 2015. ↑ Stephen, Eric (April 4, 2016). "Clayton Kershaw doesn't need run support, gets it anyway in 15-0 blowout opener". SB Nation. Retrieved April 4, 2016. ↑ Baer, Jack and Ken Gurnick (May 13, 2016). "Kershaw mows down Mets with 13-K shutout". mlb.com. Retrieved May 12, 2016. ↑ Gurnick, Ken and Troy Provost-Heron (May 30, 2016). "No win for Kershaw, but A-Gone rescues LA in 9th". mlb.com. Retrieved May 30, 2016. ↑ Gurnick, Ken. "Kershaw heads to DL with back issue". MLB. Retrieved June 30, 2016. 1 2 Weisman, Jon (July 5, 2016). "Jansen, Kershaw, Seager named to NL All-Star team". Dodgers.com. Retrieved July 5, 2016. ↑ Padilla, Doug. "Kershaw shut down due to back problems". ESPN. Retrieved July 20, 2016. ↑ Flanagan, Keely. "Clayton Kershaw Hits 60-Day Disabled List; Red Sox Avoid Facing Dodgers' Ace". NESN.com. Retrieved 3 August 2016. ↑ Gurnick, Ken (September 9, 2016). "Rusty Kershaw eased back with 3-inning start". mlb.com. Retrieved September 10, 2016. ↑ Collier, Jamal and Ken Gurnick (October 14, 2016). "NCapital gain: LA wins in DC, advances to NLCS". MLB.com. Retrieved October 14, 2016. ↑ Gurnick, Ken and Carrie Muskat (October 17, 2016). "Clayt Show! LA drops Cubs, ties NLCS". mlb.com. Retrieved October 17, 2016. ↑ "2016 National League Championship Game Six, Los Angeles Dodgers at Chicago Cubs". Baseball Reference. Retrieved October 23, 2016. ↑ Jeff Sullivan (August 21, 2013). "Clayton Kershaw's Deception". Fangraphs. Retrieved September 13, 2013. ↑ Alex Eisenberg (May 13, 2008). "Is Clayton Kershaw worth the hype". hardball times. Retrieved September 28, 2011. ↑ "Is Clayton Kershaw on Dan Partick 9/26/2011". CSN Chicago.com. September 26, 2011. Retrieved September 28, 2011. ↑ "Clayton Kershaw Fangraphs Pitchf/x". Fangraphs. Retrieved August 23, 2013. ↑ "Clayton Kershaw is still the best pitcher on the planet, and he's only getting better". Washington Post. Retrieved September 4, 2015. ↑ "2011 Pickoff leaders". Stats Inc. Retrieved September 28, 2011. ↑ C. Trent Rosecrans (September 19, 2011). "Picking the National League's best defenders". CBSSports.com. Retrieved September 28, 2011. ↑ Olney, Buster (March 20, 2014). "Creative Control". ESPN. Retrieved March 20, 2014. ↑ Harding, Thomas (September 5, 2013). "Philanthropic Kershaw honored with Rickey Award". mlb.com. Retrieved September 5, 2013. ↑ Gurnick, Ken (January 12, 2012). "Kershaw recognized as Sportsman of Year". mlb.com. Retrieved August 23, 2013. ↑ Samperio, Vincent (January 7, 2015). "Clayton Kershaw Shares Sportsman of the Year With Mike Trout". dodgersnation. Retrieved January 7, 2015. ↑ Shelley, Bill (August 31, 2007). "Kershaw Named Best Prospect By Midwest League". scout.com. Retrieved August 23, 2013. ↑ Weisman, Jon (June 2, 2016). "Kershaw named National League Pitcher of the Month". dodgers.com. Retrieved June 2, 2016. ↑ Casella, Paul (April 8, 2013). "Two wins earn Kershaw NL Player of Week Award". mlb.com. Retrieved August 23, 2013. ↑ Stephen, Eric (September 15, 2014). "Clayton Kershaw wins NL Player of the Week". truebluela.com. Retrieved September 15, 2014. ↑ Gurnick, Ken (November 4, 2013). "Players tab Kershaw as NL's Outstanding Pitcher". mlb.com. Retrieved November 5, 2013. ↑ "Clayton Kershaw Named Recipient of the 2012 Roberto Clemente Award presented by Chevrolet". mlb.com. October 28, 2012. Retrieved August 23, 2013. ↑ ESPNDallas.com (December 21, 2011). "Clayton Kershaw, Frank Howard recognized". espn.com. Retrieved August 24, 2013. ↑ "Kershaw headlines the 2006 All-USA high school baseball team". USA Today. June 29, 2006. Retrieved August 23, 2013. ↑ Allison Brown (March 8, 2010). "North Texans on Opposite All-Star Teams". NBC.com (Texas). Retrieved July 12, 2011. ↑ Hugh Bernreuter (September 24, 2011). "Clayton Kershaw, Shawn Tolleson hope to reunite as members of Los Angeles Dodgers". The Saginaw News. Retrieved September 28, 2011. ↑ Passan, Jeff (May 14, 2008). "Clayton Kershaw's great expectations – MLB". Sports.yahoo.com. Retrieved September 28, 2011. ↑ Berg, Ted (July 30, 2013). "Clayton Kershaw disses International Astronomers Union over Pluto". USA Today. Retrieved August 1, 2013. ↑ Texas Birth Index, 1903–1997, United States Census, 1988; Dallas, Dallas, Texas; page 2713,. Retrieved on June 28, 2013. ↑ Kansas State Census Collection, 1855–1925, United States Census, 1925; Browns Grove, Pawnee, Kansas; roll KS1925, page 113, line 14. Retrieved on June 28, 2013. ↑ "Christopher George Clayton Kershaw (1949–2013) Obituary". Dallas Morning News. April 30, 2013. Retrieved September 12, 2013. ↑ Jaklewicz, Greg (November 18, 2011). "Cy Young winner's wife is granddaughter of Abilene baseball fan". reporternews.com. Retrieved August 23, 2013. ↑ edmonadmin (February 11, 2011). "Highland Park Presbyterian Church – Dallas Wedding Photography – Ellen and Clayton Kershaw". edmonsonblog.com. Retrieved September 12, 2013. ↑ Prejean, Jeanne (January 26, 2015). "Ellen and Clayton Kershaw Welcome Cali Ann Kershaw to the World". mysweetcharity.com. Retrieved June 14, 2015. ↑ Hernandez, Dylan (February 28, 2010). "Dodgers' Clayton Kershaw keeps the faith". The Los Angeles Times. ↑ Passan, Jeff (May 14, 2008). "Like it or not, Kershaw is about living by the book". LA Times. Retrieved September 28, 2011. ↑ Bernreuter, Hugh. "Clayton Kershaw makes appearance on New Girl after Super Bowl", MLive Media Group, Friday, January 31, 2014. 1 2 "Kershaw's Challenge – Strikeout to Serve". Kershawschallenge.com. Retrieved September 28, 2011. 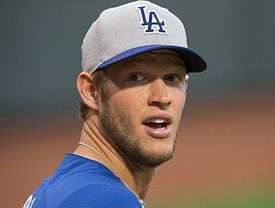 ↑ "Sherrington: Ex-Highland Park star Kershaw's an ace when giving back". Kershawschallenge.com. November 5, 2012. Retrieved November 5, 2012. ↑ "Kershaw's Challenge – 2014 Overview". kershawschallenge.com. Retrieved August 27, 2015. ↑ "Kershaw's Challenge – 2015 Project". kershawschallenge.com. Retrieved August 27, 2015. ↑ Cassavell, AJ (April 24, 2012). "Trio of Dodgers assists Habitat for Humanity". mlb.com. Retrieved August 23, 2013. ↑ "Kershaw's Challenge – Peacock Foundation". peacockfoundation.org. Retrieved August 23, 2013. ↑ Rovell, Darren (November 14, 2014). "Kershaw signs on with Subway". ESPN. Retrieved November 15, 2014. Wikimedia Commons has media related to Clayton Kershaw.